September 29th was the day we view as having begun the market mess that characterized the beginning of the month. The S&P 500 was down 8.8% that day, sending the market into a further tailspin over the next two weeks. The markets were up only one day out of ten, and the S&P was down over 25%. 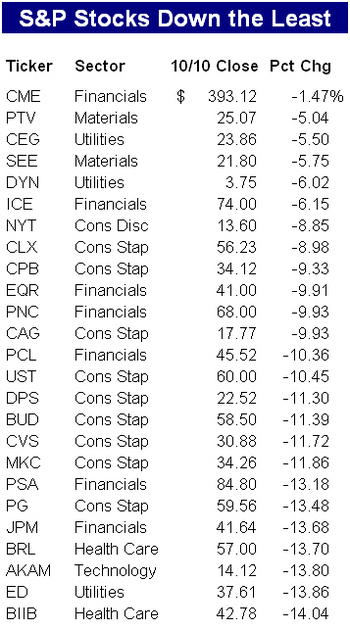 Every member of the S&P 500 was lower during that period, below we highlight the stocks that were down the least and those that were down the most. 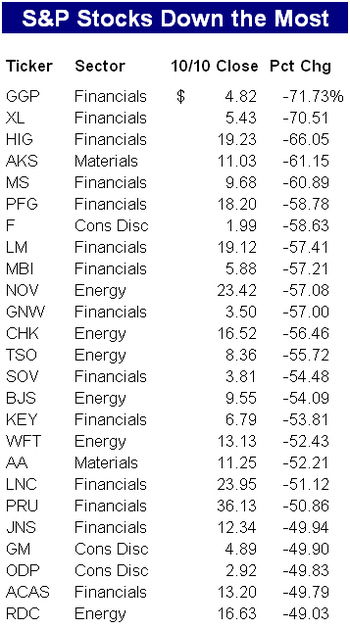 CME posted the smallest decline, down only 1.47%, while GGP was down the most at 71.73% after cutting its dividend. With many expecting the market to snap back very quickly, some of these stocks could emerge as market leaders, while others may recoup losses. Hello, nice to your comments. Bother you a little time, everyone knows that Nike shoes? Yes, we are Nike shoes promotion department, is mainly responsible for the network popularization. You now have the chance, because that belongs to Nike authorized direct participation in the activities, so we are on the price of cost price, hope you grasp the good opportunity. Thank you, wish you happy! When a person pays me an surprising compliment, I generally inform them that they produced my day! What about you? Charts looks a little surprising. Im glad to know them anyway. You now have the opportunity, because it belongs to the Nike authorized direct participation in activities, so we at cost price, hope you grasp the good opportunity. Thank you, wish you happy!